We just returned from a very special trip to visit very family in Piemonte, Italy that just happened to be prefaced with a quick tour of Zürich and Basel and ended with a week on an island in Croatia. Though we were on the road for about two weeks, it felt very fast. 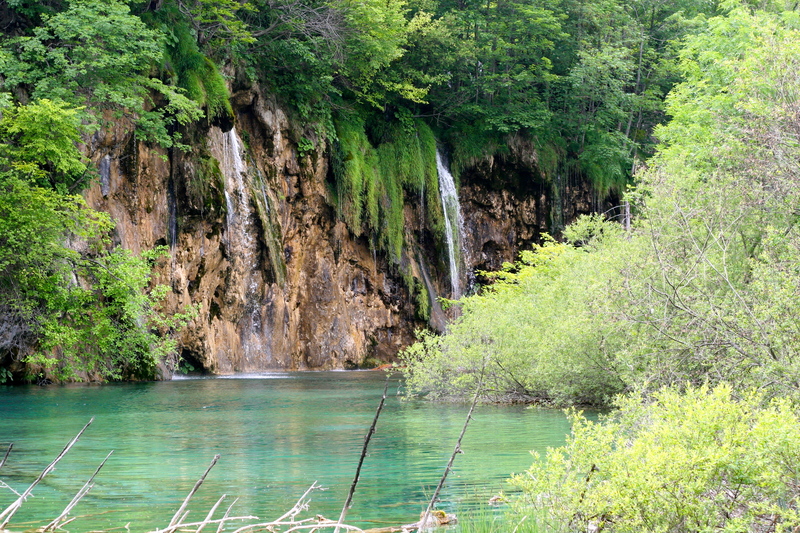 Many outdoor markets, lots of pizza, more ice cream, homemade Croatian extra virgin olive oil in an empty Coca Cola bottle, grilled fish, sundry new pastries, waterfall hikes, and many sunny beach days. Our trip was not all bliss, however. 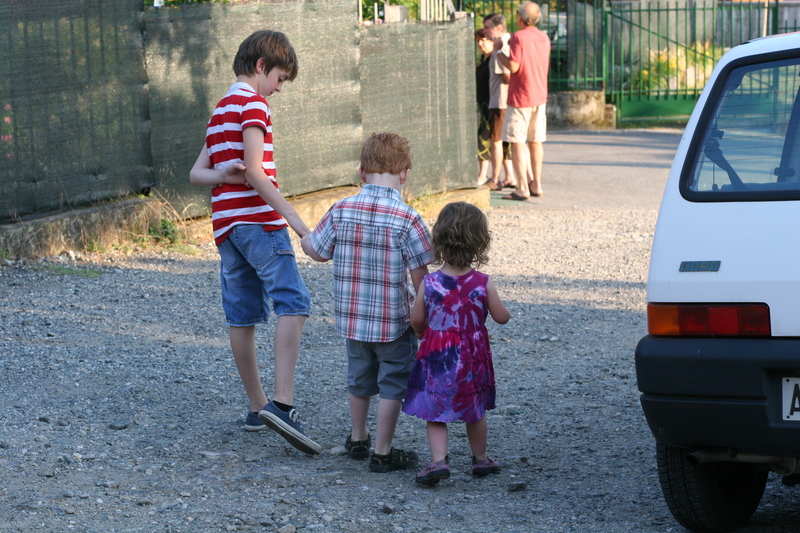 Our decision to make the huge journey to Europe with two little children in tow was prompted by the tragic knowledge that one of my favorite people on the planet, an Italian cousin of mine, was in the final stages of cancer. Three weeks before we departed he died. Have you ever met someone who catalyzes everyone around her/him? Who, by some miracle, enables others too to relish life and seize each moment before it escapes? For so many of us it takes excruciating loss to rip us from our day-to-day life of worrying about the little things and remind us that what is most important in life lies right in front of us–the people we love. My cousin was a miracle worker then. No matter if business was bleak or his health, which he hid from his children for quite some time, was deteriorating rapidly. He savored every minute of life and it was impossible not to join him. His death last month was a bit out-of-body for me. It had been almost three years since I last saw him. 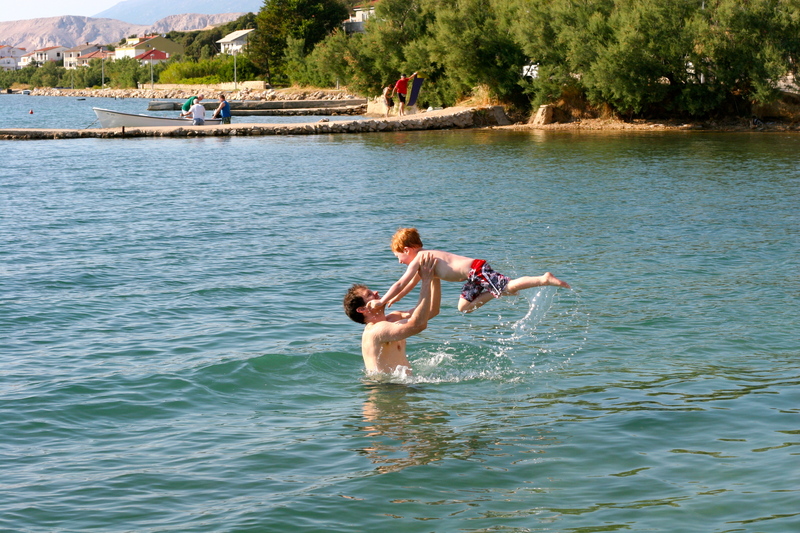 I knew about his cancer, but it seemed under control and I thought that surely I would see him again. Living a continent away and being with neither him nor his family regularly made his death surreal. I thought of so many moments with my cousin–picking grapes with him for the vendemmia (wine harvest) at the family vineyard, taking God-awful hot grappa shots (as if cold grappa were not horrid enough) at each of the local bars at the Ivrean Carnevale, enjoying the peace of walking around the ring of lakes nestled in the foothills, but most of all joining him and his wonderful wife around the kitchen table for late-night animated discussion. He was thoughtfully opinionated, well read, and even better traveled, and when he laughed there was always a hint of mischief. The most terrible part of my cousin’s loss for me became my sympathy for his wife and two children, now that I have two of my own. I am ashamed to admit I fretted about what I would say. For all my anxiety, our visit was beautiful because of the children. 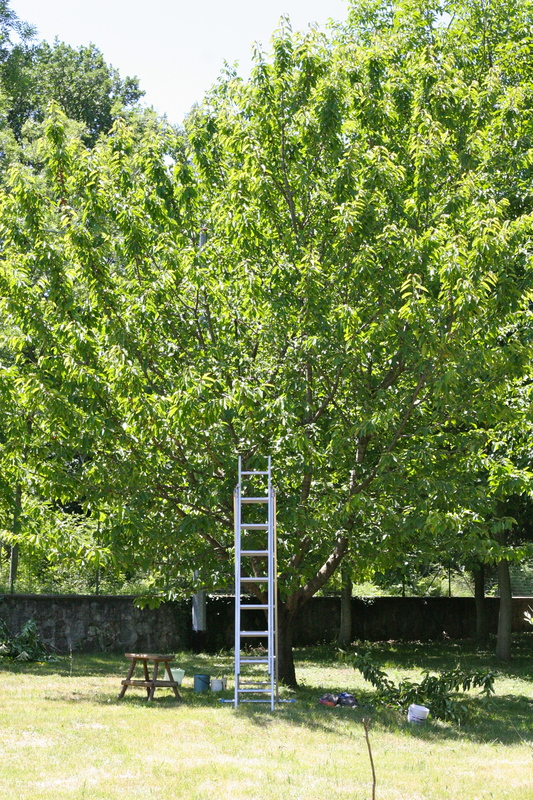 On our first day all together (with his wife and children, almost eighty-year-old mother, and brother and his wife) we met at the vineyard to cull all of the vibrant juicy cherries from a tree that was planted upon the birth of my cousin’s now teenage daughter. That in itself was special for all of its symbolic implications. No doubt, it was impossible not to see my cousin in everything we did. Yet somehow, as we all lunched together at the huge family garden amidst the bright green grape vines and munching focaccia, prosciutto, Val D’Aostan toma cheeses, canestrelli cookies, I felt more at peace. 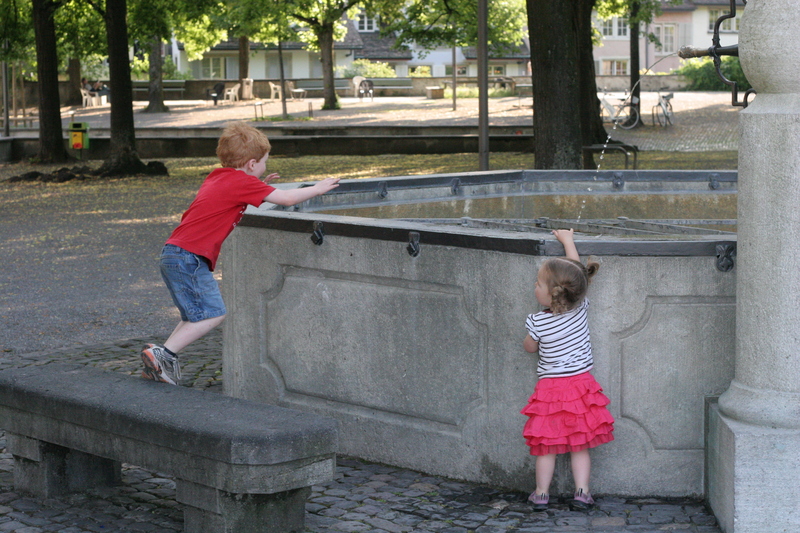 It warmed my heart to see my children playing with their Italian cousins, kicking around the soccer ball, climbing the cherry tree, and generally being goofy kids. I saw beyond our moment in time to our children’s future friendship and their own cross-continental bond–the next generation. I have many things to share with you from the trip, but for now I leave you with a perfect homecoming meal. Usually I make something with whatever I have in the pantry, a rice or pasta, but this time I had fresh ingredients right outside my door. One of the most exciting things about coming home was to see the transformation of our garden from plugging-along to lush, especially our potato plot. While I have grown many different vegetables, this year is my first time working with potatoes. I am crossing my fingers that we will not be affected by blight, but thus far they have been wonderful to grow and so much fun for my kids. For those of you who do not know how potatoes grow, they are extremely interesting. First of all, they are really economical. One pound of seed potatoes will yield about ten pounds to harvest. We planted five pounds at the beginning of the spring. After allowing them to “chit” near a sunny window (enable the first sprouts to poke out of the eyes of the potato), I planted my tiny little fingerlings. After the plants grew six or eight inches tall, I covered all but the very tops of the plants with more soil (“eathing up”) and repeated this three or four times every time the plants grew tall again until right before we left for Europe. 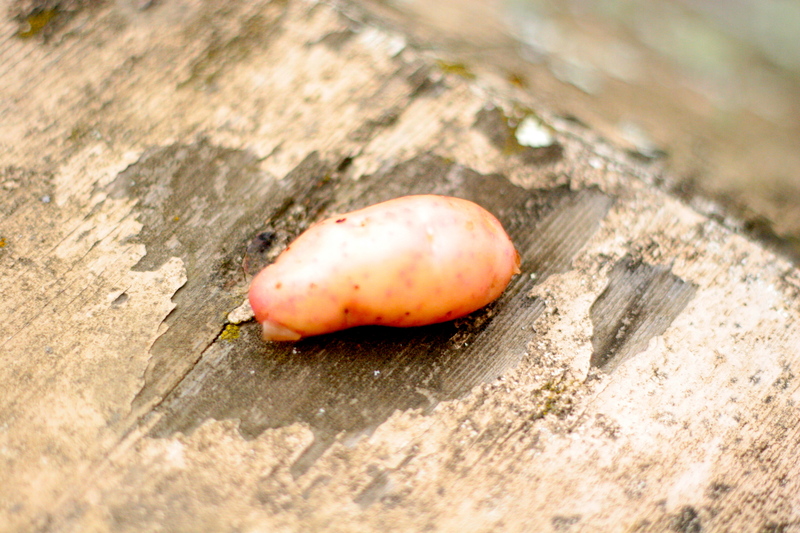 From one tiny bit of potato a tuber grows to develop more than a dozen new potatoes. It is phenomenal. You can wait until the plants wither before unearthing the potatoes whereupon they will have tough enough skins to keep for a couple of months, just like any potato you purchase from the market or store. 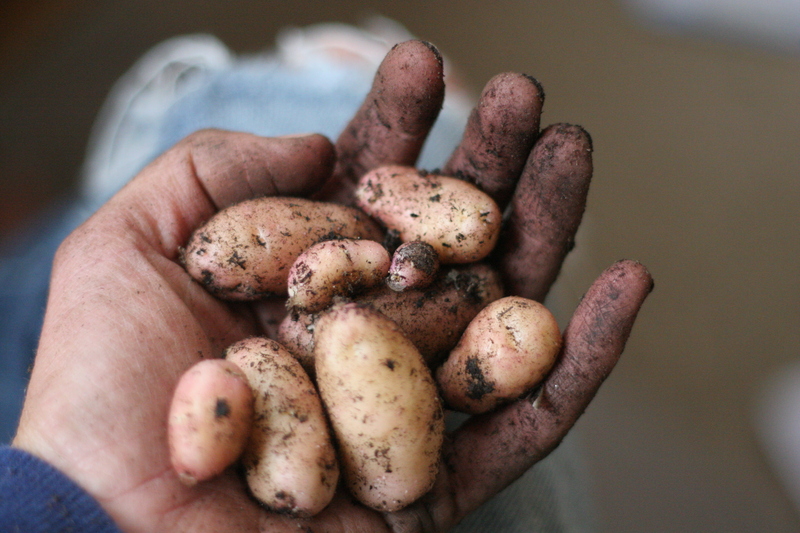 Or you can harvest them as soon as the plant flowers and eat….da, da, da!…..new potatoes. I think before we even visited the bathroom after entering our home my kids and I barged out the backdoor to visit our garden and I squealed with delight (yes, squealed) when I saw that some of my potatoes were flowering. I am sure I could have waited another week or two for more than two flowers on the plant that I robbed, but I could not wait. Our first meal back consisted of gently cooked Rose Apple Finn fingerlings with a gorgeous rosy hue and, given that there were only a dozen little potatoes, I put them into a dinner salad with a bunch of fabulous ingredients right out of our garden. New potatoes, which you can get from your farmer’s market between now and the early fall are one of life’s big treats. In all honesty, I have never been a huge potato person. I eschew mashed potatoes during the holidays and I would almost always prefer bread, pasta, sweet potatoes, rice, you-name-it, for my starch. I changed my mind last year when we received new potatoes in one of our Mystery Boxes from Mariquita Farm. The skin is so fragile and thin and the potatoes so new that they really give meaning to the old axiom that potatoes taste “buttery.” They need minimal cooking and adornment. After cooking them briefly in some salted water, I let them cool and dress them with my new favorite olive oil and sea salt. I then add the rest of my salad ingredients and finish with just a bit of vinegar. I am already eyeing the next tuber that I will take down and I have big plans for each and every one. In fact, I just ordered five more pounds of potatoes to plant for a fall harvest which arrived today. Boil very salted water and add the potatoes. Cook for about 5 minutes or until a fork just slides into one of the potatoes. Let cool or rinse with cool water if you are in a hurry. Place into your salad bowl and cover with the olive oil and some sea salt. Toss and then add the lettuces and chives and toss to coat. Add the vinegar, gently tossing once again and then taste for balance of flavors. 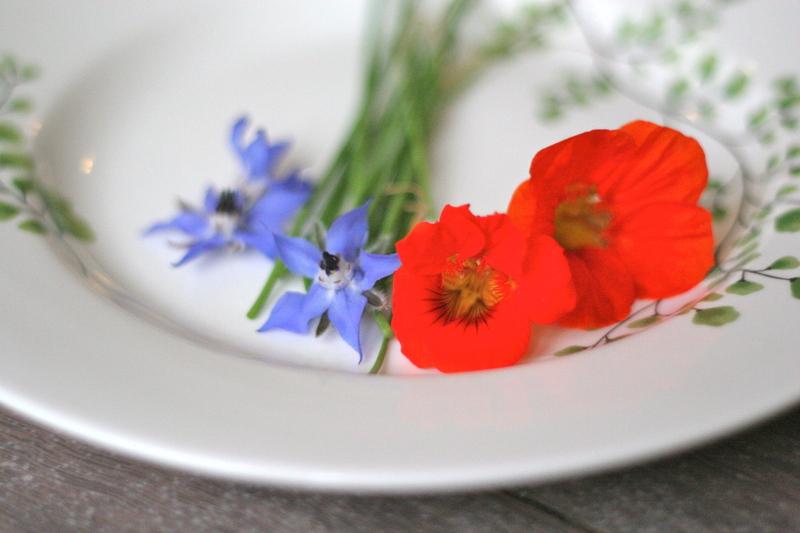 Add the flowers and peas and serve. 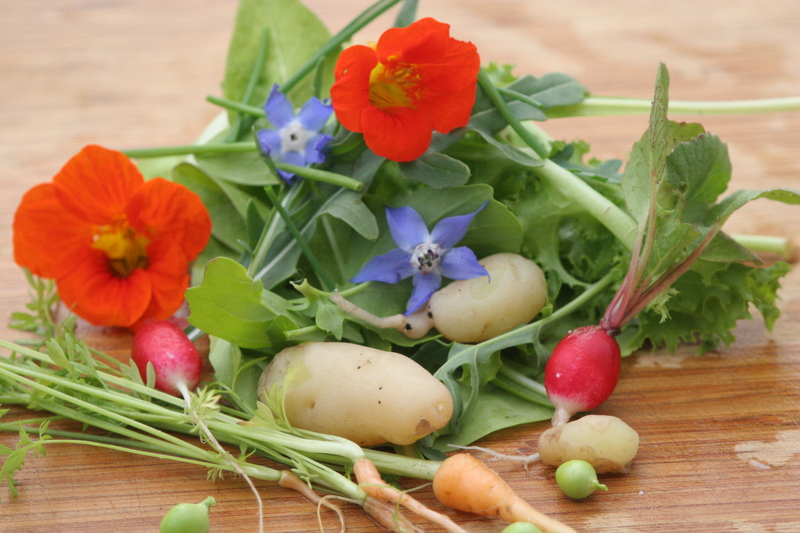 This entry was posted in Salad, Uncategorized, Vegan and tagged Edible Flowers New Potatoes, Garden Salad Recipe, New Potato Salad Recipe, What to make after travel. Bookmark the permalink. Welcome home! You’ve been missed. I am very sorry to hear about your cousin. It sounds like you found wonderful ways to celebrate his life. Welcome back! I certainly missed your posts. What a lovely tribute to our dear cousin. He will be missed, but his legacy clearly lives on. Congratulations on your first potatoes – they look amazing!